As a result, the Commission began implementing new safety standards for household products in the United States. In his life, Hill broke down societal, cultural and professional barriers in a career spanning four decades. Born in St. Joseph, Mo., in 1915, Hill attended Johnson C. Smith University for his undergraduate education and was later admitted to a doctoral program for chemistry at MIT. Upon finishing his doctorate in 1942, Hill had so much difficulty finding employment – on account of the color of his skin – he later recalled sending out more than 54 applications before finally landing a job. However, once given an opportunity, Hill’s career soared. For two years, he served in the Office of Scientific Research and Development – an agency of the federal government created to coordinate scientific research for military purposes during World War II. Later, he rose to the role of research director and vice president of a large northeastern company. He then went on to found his own lab in 1961, which developed intermediates for rubber, resins and plastics and offered consulting services to the polymer industry. 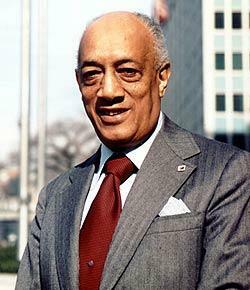 In what was perhaps the crowning achievement of his career, in 1977 Hill was the first African-American elected as president of the American Chemical Society (ACS). Following his death just two years later, the ACS established the Henry A. Hill Award, given annually to recognize distinguished service and professionalism in the field of chemistry. Dr. Hill himself posthumously became the first recipient of the award in 1980.